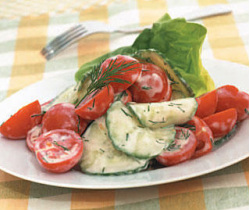 Place cucumbers and tomatoes in a serving bowl. In another bowl, mix remaining ingredients. Stir dressing with veggies. Adjust the dill & pepper to taste.